Are you planning an overseas trip this year and are not sure where you should go. This is the question many people consider every year. The choices are endless and will depend on many factors, like budget, vacation time and what you want to see. If you make the decision and choose South America, you will need to include Peru on your itinerary. Peru is one of the most diverse countries on the planet and has something for everyone. One of the most popular destinations in the Andean Country is Cusco. Why visit Cusco city you may ask. 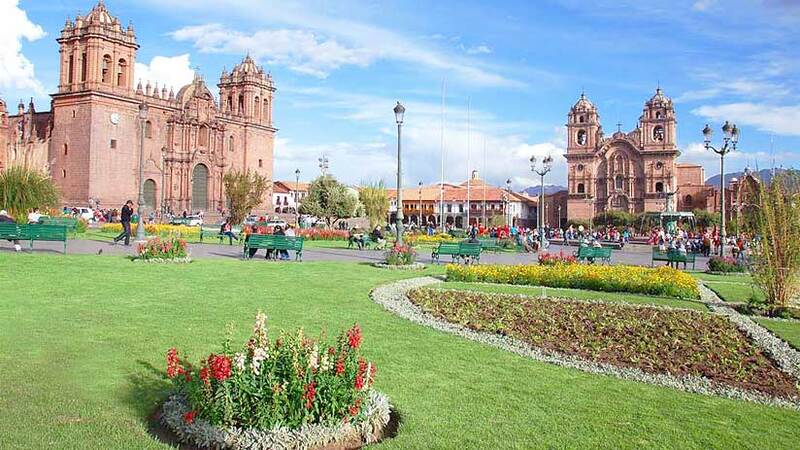 Cusco was the home of the Inca Empire, Cusco is filled with ancient Churches and temples that you will need to see. The city is full of cobblestone streets and Inca walls that will delight the history buffs among you. Not only is there history to discover but on any visit to Cusco you should take the time to pass a few hours at the San Pedro Market in Cusco. 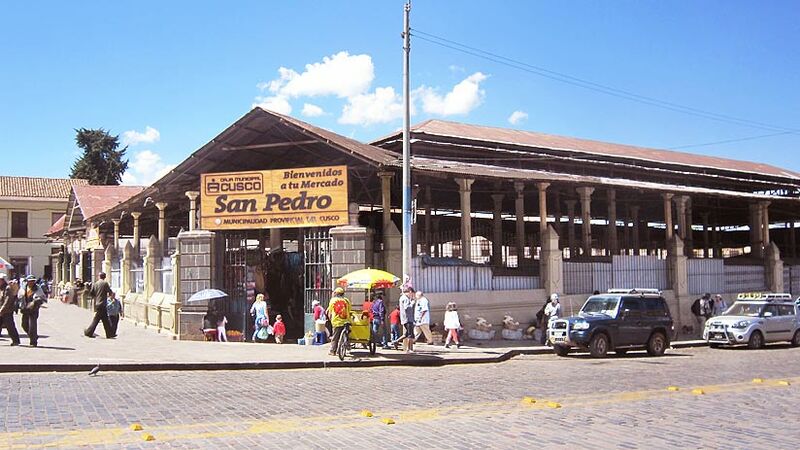 San Pedro Market in Cusco is located in the historical center of the city, one block from the main square. The market is an interesting place to explore and has many interesting parts. When you first enter the market, you will be in the section where you will find much color and interesting things to buy. 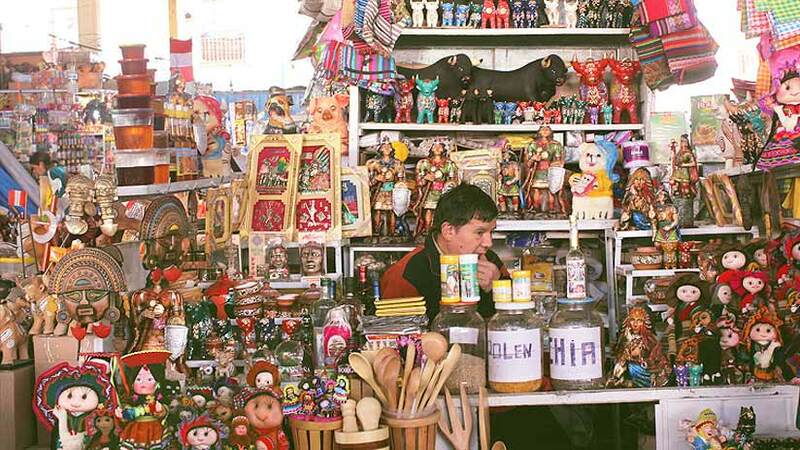 The souvenir section has everything from pens with llamas attached to colorful dolls to table clothes and pillowcases. If you wish to take home an alpaca jumper than this is the place to go. Interesting hats with ear covers which are popular with the locals are also on offer. Walk down into the market a little further and you can buy one of the many costumes used for the local dances. These elaborately decorated clothes will be the talking point at your next dinner party when you hang them on the wall. Do not forget to ask about the history of the costume and what dance it is used for. Not only can you buy all the necessary memories a little further down you will see the local women selling meals very cheaply. For a few soles, you can buy lunch, which consists of soup, a second and a drink. The menu features a Peruvian dish, which usually consists of meat or chicken and rice. 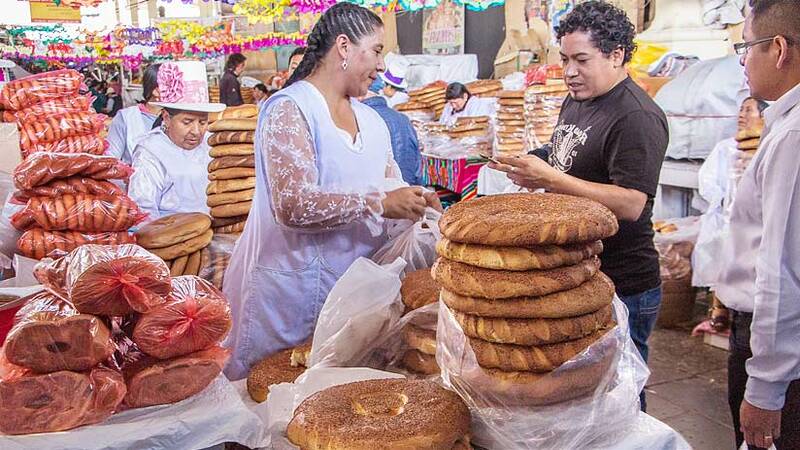 In the morning, you can also eat breakfast at the San Pedro Market. There is a section of juices that you really should try. Every combination imaginable or just make up your own, a great way to start the day. Along with your juice try, a sandwich freshly prepared and will fill your belly until lunchtime. 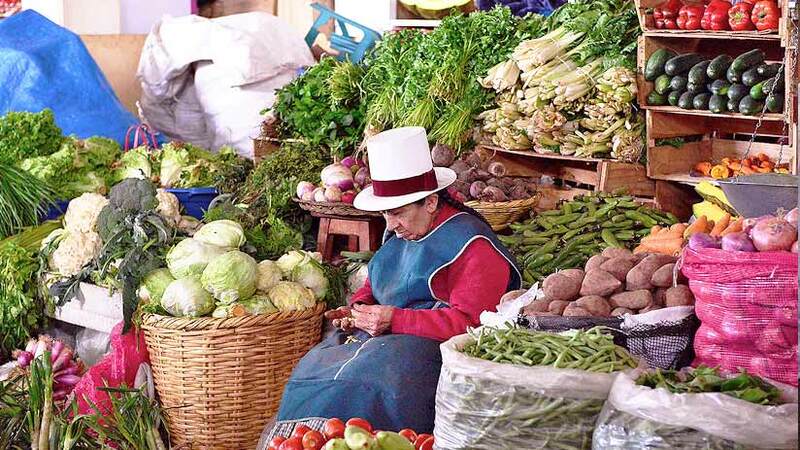 The Andean country is home to some of the world´s healthiest foods. Peru superfoods healthy fuel for your body with locally grown Quinoa, Maca and Camu Camu a feature. Try some of these grains while on your Peruvian holiday. Also at breakfast time in the San Pedro Market, there are a variety of porridge drinks featuring Quinoa and Maca that will give you the energy you will need to get through the day. 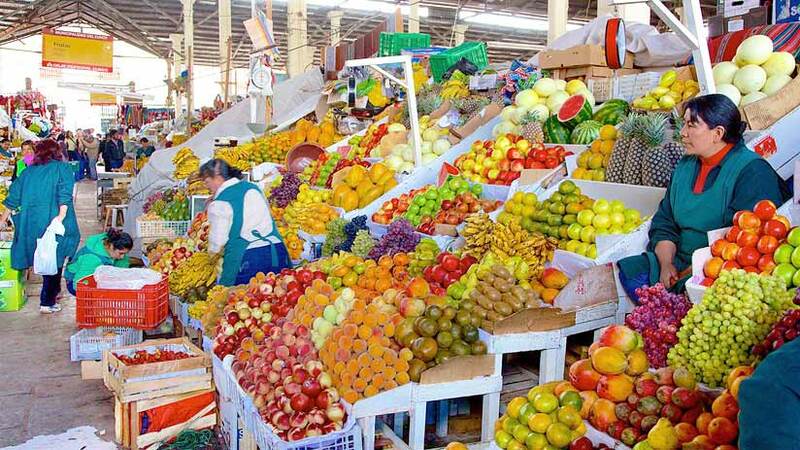 In the bottom half of the market you will find all the fresh fruit and vegetables to keep you healthy on your Peruvian tour. Also on sale are meat, chicken and fish and it is here that the local people shop for their families. Lastly, in a small section at the side entrance you will find senoras selling lovely beautifully colored flowers. From roses to lilies, the variety is astounding. The photo opportunities are endless so be sure to take your camera. Not only visit the San Pedro market, Cusco is full of fascinating attractions for the tourists, so here are top 4 favorite leisure activities in Cusco. Do a City tour, see the churches of the city and the visit the ruins just outside of Cusco. Learn all the history of this majestic Inca city. Visit the museums; Cusco is full of museums to visit to learn about the history of this colorful city. Sample all the restaurants and the world famous Peruvian cuisine. Cusco is home to some of the best restaurants in Peru and the variety on offer is endless. Not only are there restaurants to try, but the nightlife in Cusco is famous all throughout South America. Go on a free walking tour of the city. From the Plaza behind the main square every day at 11 am you can experience the free walking tour look for the people in the green vests they have tours in English and Spanish. 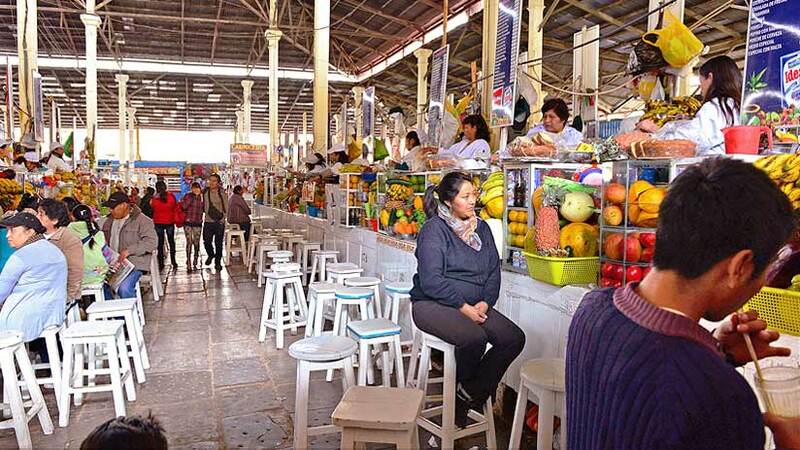 Cusco is the place to visit in Peru and South America for ancient history and culture and while you are in Cusco do not forget to visit San Pedro market, this will give you an insight into the daily life of the people of Cusco. What are you waiting for book a trip to Peru today. Peru Activities, Travel To Peru cusco. permalink. Peru Festivals: What is Qoyllur Riti?